My husband is the king of cords. If it recharges or has prongs, we have it--and it's probably plugged into a power strip. For the most part, I try to ignore what must be the neighborhood's greatest phantom power load. When it comes to putting our house on the market, though, I untangle those rats' nests myself. You don't want a buyer to assume that there aren't enough outlets for all his toys. If outlet shortage or bad placement really is your problem, then you should temporarily remove some of your appliances for a cleaner look. Who knows? You might find something valuable in there, like I did this afternoon. We just ordered a replacement charger for our camcorder ($25). 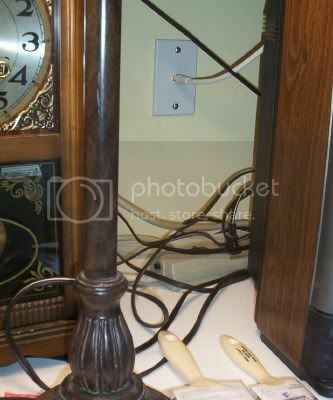 The original was so tangled behind the TV that no one even noticed it was still plugged into the wall. When I had a tangle in my hair, my mother used to call it a rat's nest.